Wow, I remember being in 4th grade when the first Harry Potter film came out and now the final film is here, ending an outstanding series that I feel privileged to have grown up with. So to celebrate I’m counting down my top 15 favorite moments from this amazing series. Now it’s not easy to select just 15 moments or even 100 for that matter because there are so many great moments in this series but I’ll do my best. 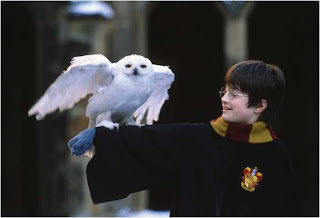 So prep your brooms and get ready to launch into my top 15 favorite moments from the Harry Potter Series. Of all the films in the sires, this one has my favorite opening , I love how it starts with the WB logo, we hear Bellatrix in the background, followed by flashes on the events from the last film. Then the title shows up with powerful music playing in the background and then we get awesome shots of the camera zooming through ales and crashing through walls. It’s almost like a theme park ride. Overall a great opening, too bad the rest of the film isn’t as exciting. 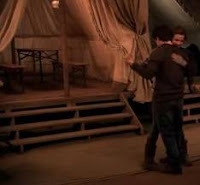 Of all the relations in this series, the one that always came off as the strongest to me was the true friend ship between Harry and Herminie and this little dance was simply the most joyful moment between the two. This whole movie was like a collection of adventure serials with Ron and Harry getting in one huge predicament after the next. 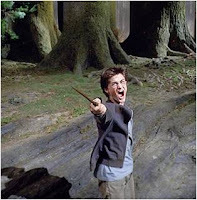 But the most exciting moment for me was when they were trying to escape the dark forest from an army of killer spiders. It was intense, thrilling, and the last time we would see that awesome flying car. 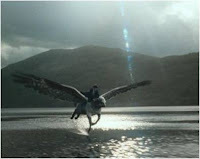 This is just an awesome scene, Dumbledore is about to be taken away to prison but he makes a quick escape by grabbing onto the tail of the Phoenix and disappearing in a large, fiery eruption. What better way to end it then with this fun line, “You may not like him minister but you can’t deny, Dumbledore’s got style”, perfect. Now this was a teat, what better way to get you excited for the adventure ahead than by starting the film with an awesome sky chase. Spells are being fired left and right, the stakes are higher than usual because more characters are involved and we get lots of on road vehicle destruction, awesome! I don’t know what it is about this scene that I love so much but there’s something moving about it. It’s the first time we really see Harry have a simple heart to heart conversation with another teacher. There’s no life changing moral or anything but the setting is great, the background music is nice and soothing and Lupin’s words carry so much care and understanding towed Harry and his family that it makes for such an emotional little moment without anything being to overly dramatic, it’s all simple and pure. This was such a perfect first shot of Hogwarts castle, the music fits it perfectly and it’s such a memorable little moment that it’s actually on par with seeing the Emerald City at the end of the yellow brick road for the first time from “The Wizard of Oz”. This small little musicale number is just awesome! The lyrics are great, the sound of the low drum in the background is perfect and it creates such a foreboding, yet lively atmosphere. I love how beautifully all the visuals and images match with the song. First we see a dark reflection of Harry’s face in a window, then it dissolves to a shot of horseless carriages ridding off in the rain and finally the interior of the great hall, fantastic! The entire third act of this film is just one amazing action scene after the next with all the characters trying to escape the ministry. What better way to end everything then an amazing one on one wizard dual between Voldermort and Dumbledore. I could have filled this list entirely with scenes from this battle, but if I had to choose one action moment it would be this dual. It’s not just a collision of spells, there are all kinds of energy elements that are being used, like water, a fire snake, shattered glass, shadow energy, it’s just an amazing dual. None of the previous films ever gave use anything like this awesome story. This was so unique, the visuals and animation were strange yet so fascinating at the same time. I love the whole mood, atmosphere, its terrific ways of making transitions and Emma Watsons narration was so cryptic that it brought everything to life perfectly. I couldn’t pick one individual Quidditch match, there all outstanding. The first time seeing a Quidditch match in the first film was simply amazing, I had never seen anything like it before. 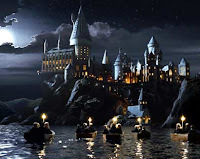 The second film just built on top of it by having Harry compete against Draco and get chased by that rouge bludger. The third film was much darker and more haunting, the rain is falling on them, the grim (creepy dog omen of death) appears in the sky and Harry is chased be death eaters. 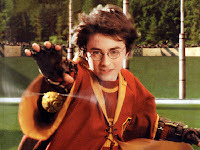 Bottom line, whenever I watch a Harry Potter film, always look forward to the Quidditch matches. It was such a spectacle to see Harry find the strength within himself to conjure a massive PETRONAS shock wave that takes out an army of death eaters. The music, the visuals, the sensation of this whole scene was simply riveting. I absolutely love atmospheric flights in films and this is when I first discovered how effective they are. I love all the different shots of the castle and landscape and how it all matched perfectly with the stunning music in this scene. It almost feels meditative and it fully allows you to take in all the atmosphere and genius that the film has to offer. This is something that I can only describe as the best feel good moment of the entire series. There couldn’t have been a more satisfying ending then seeing the great hall in thunderous applause, we get one final shot of every main character (including one last great shot of Richard Harris as Dumbledore), the camera backs out a window, we get an amazing final shot of the castle, all matched with some great music and it always leaves me with such a powerful and satisfying feeling, like this is the perfect way to end a film. This scene is just epic and it’s one of the most powerful moments I ever experienced in the cinema. 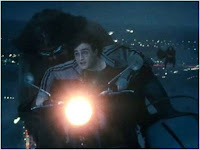 Harry is being torn apart by Voldermort and we get a lot of creepy images and negative flashbacks from the previous films, (which is really cool, how often does a character flashback on events from past films). Then from looking at his friends he remembers why he has strength over Voldermort, he’ll never no love or friendship the way Harry does and then in his last breath he looks at his enemy and says “I feel sorry for you”. This is why we love this character, he’s a hero who looks at his enemy, not with hate but with sorrow that he’ll never know what it’s like to be loved. He then defeats his enemy by bringing up all positive thoughts about the times he’s had with his loved ones. The music in this scene is stunning, the images are right on, and the emotion in this scene is the highest that have ever come from this series and that’s why it stands as my favorite moment from all the Harry Potter films. Will the last film have a scene that can top this, well find out, when I review Harry Potter and the Deathly Hollows part 2.